How long have you been passionate about wellbeing? Which particular areas interest you the most, and why? Liz: I’ve been researching and writing on many areas of wellbeing since 1985, when I started as a junior health and beauty writer for the glossy monthly magazine Woman’s Journal. It was here that I was fortunate to be mentored by some great writers and editors, who encouraged me to write not only articles, but books too. My first book, Vital Oils, was published in 1991 and was one of the first to emphasise the importance of plant oils (rich in essential fatty acids) in the diet. Since then, I’ve spent most of my working life investigating botanicals and other natural ingredients and strategies that can help make us look good and feel better. I’m enjoying getting back to publishing – with my new books and quarterly Liz Earle Wellbeing magazine. How do you feel about starting a completely new venture? It feels more like returning to my roots and I’m looking forward to spending more time researching and writing about some fundamentally important issues that affect us all, from environmental concerns to healthy, sustainable food and many other important wellbeing topics. I’ve had more time to get back into researching and writing digital e-books, work on recent print books (including Juice (Kyle Books), SKIN and The Good Gut Guide (Orion Spring)) and write content for my magazine, Liz Earle Wellbeing Yearbooks and website too. What are your hopes for Liz Earle Wellbeing and what can we expect to read about on the website? Fundamentally, we’re all about feel-good food and overall wellbeing, with an emphasis on food provenance and production.This website is also about looking good with the best beauty advice, as well as doing some good along the way. That’s why we have links to many charities and collaborate with others who give back and help others. I’m keen to promote ethical and fair enterprise as well as philanthropy right across the board – from pasture-fed food to ethical sourcing and Fairtrade jewellery – and more! What’s your own take on how to eat well? For me, it’s all about balance. That is something I’ve learnt over the last thirty years or so of writing on the subject. Although I’ve never been vegan, I did spend some time in my early twenties as a macrobiotic and really enjoyed the focus on the (back then) new and novel foods such as brown rice, tofu, edamame, miso and seaweeds, but I always ate fish, seafood and eggs. These days, my advice is to cook from scratch using seasonal ingredients, locally sourced where possible, avoiding processed and packet food. It’s also important to check where our food comes from and how it’s been produced. For example, grass-fed beef and eggs are a surprisingly good source of omega-3s due to the pasture the animals eat. It’s not just what we eat that matters, it’s what we eat has eaten that counts too. And don’t forget your gut health! Probiotics are key. You’ve written over 30 books. What are your future publishing plans? Well, I’ve launched a set of completely new, updated and revised editions of my original Quick Guide series, including Youthful Skin, Food Combining, Herbs for Health, Juicing, Aromatherapy, Detox, Healthy Menopause, Acne, Successful Slimming, Vitamins and Minerals, Antioxidants, Dry Skin and Eczema, Vegetarian Cookery, Beating Cellulite, Healthy Pregnancy, Beating PMS with many more titles to follow. These are all available now on Amazon as digital downloads. I published a new juicing book, called Juice (Kyle Books) in 2015; SKIN (Orion Spring) in September 2016 and The Good Gut Guide (Orion Spring) published in May 2017. There’s plenty more in the publishing and video pipeline too, so do sign up to my wellbeing newsletter if you’d like to be the first to hear of our news and events. What is your connection now to the Liz Earle Beauty Co.? I’m enormously proud of co-founding Liz Earle Beauty Co. and its wonderful original Isle of Wight team. My co-founder Kim, our CEO, management team and all the other stakeholders in our business decided to hand over the reins to a much larger organisation with global business expertise back in March 2010, with the aim of allowing this special beauty brand to grow and secure its future around the world. Although my name is on the brand, the company was not solely owned by me (I was a minority stakeholder when we came to sell), so the decision was a group one. More recently, in 2015 the Liz Earle Beauty Co. was acquired by Walgreens Boots Alliance (WBA) and the beauty brand is now working closely with their group, including Boots, both in the UK and internationally. After 22 years of working with the Liz Earle Beauty Co., I have now decided that the time has come for me to move on and leave the brand I love. I will be concentrating on my primary passions of health and wellness, developing new projects and partnerships, and focusing on my quarterly magazine, Liz Earle Wellbeing. I wish the beauty brand and its wonderful team on the Isle of Wight the very best for the future. It has been an incredible journey. I will be staying connected to the world of beauty and wellbeing with new ventures to come. Stay tuned to Liz Earle Wellbeing for future news. The beauty company has always had a firm commitment never to either animal test Liz Earle Naturally Active beauty products, or use any ingredient that has been animal tested since 1998 – a fixed cut-off date commitment that I established, which is a commitment that goes beyond almost any other beauty brand in the world. When the beauty company was originally sold back in 2010 to Avon, it was on the understanding that Avon were the first of the global beauty multinationals to have banned animal testing and they were leaders in this field. After the acquisition, it was revealed that Avon had decided to sell in China, which required animal testing. I was told that this involved around 1% of their own Avon products, a tiny percentage, but not surprisingly, it was enough to trigger protests. However, the Liz Earle Naturally Active beauty products have never been sold in China. The Liz Earle Beauty Co. is now part of the Boots family, and Boots share a commitment to no animal testing and they have said that this position will not change. Unlike almost all other premium beauty brands, the Liz Earle Naturally Active brand does not sell in China, nor does Boots sell its products there, including Boots No 7, for the same reason. Liz Earle Naturally Active is one of the few premium beauty brands to have been certified by the Humane Cosmetic Standard by Cruelty Free International (previously known as BUAV) for many years. As far as I’m aware, it continues to lead the way here – as it always has done. Is this website part of the beauty company? No. 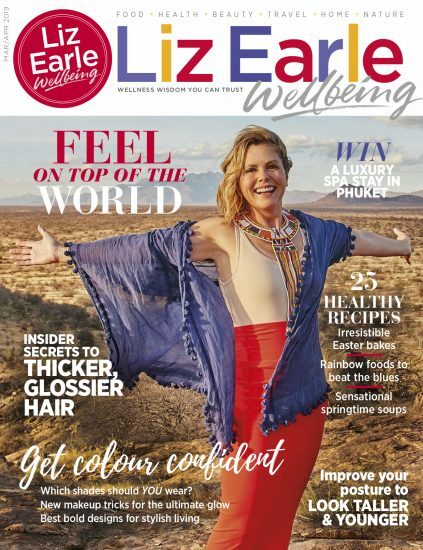 This website is totally separate and part of my new digital and print publishing venture Liz Earle Wellbeing. It is also where I talk about my health and wellbeing campaigns and the humanitarian charity I founded, LiveTwice. This website and my publishing and television work is completely independent from Liz Earle Beauty Co. This is the place where you will find the authentic voice of Ms Liz Earle MBE – the real person – and not the skincare brand that bears my name! How old are you? I was born on May 17th 1963, so that depends on when you’re reading this! I’m currently 53. Where do you live? On an organic, pasture-fed farm in the UK’s West Country. Where do you work? All over the place! Mostly from my Wellbeing Studios in Battersea, in south-west London. How many children do you have? Five, two girls and three boys, ranging in ages (currently) from 26 to just 7. When was the beauty company sold? Kim, other shareholders and I sold the company in March 2010 to Avon. It is now part of the Boots family (see above).